The Branded Butcher at Georgia Theater (Athens, GA): Though dining inside is always an option, if you head to the top of Georgia Theater, Chef Trey Rayburn’s delicious food can also be enjoyed on the rooftop patio—you may even get to hear the downstairs show. Pure Taqueria (Roswell, GA): Atlantans have long loved the carne asada tacos at this locally-owned Tex-Mex chain. Though their other locations boast great patios, the Roswell outpost has a new open-air, adults-only bar where margaritas flow like water while live music plays. The Florence (Savannah, GA): The best seat in the house just may be the rooftop patio—wood-fired pizzas and scratch-made pastas always taste better in fresh air. 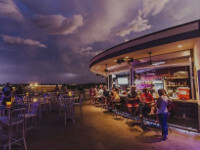 Cru Wine Bar (Alpharetta, GA): Suburbanites have been flocking to Avalon since it opened last year—there’s no better spot to take it all in than on the rooftop bar at Cru. Why not try the Royal Riesling flight, perfect on a cool summer night. Steel Magnolias (Valdosta, GA): Situated in the heart of downtown Valdosta is this charming Southern eatery with an open-air rooftop dining room that’s not to be missed. Go for the pimento cheese wontons and deviled eggs, the ideal accompaniment to the live music often playing in the background.